Hong Kong Mahjongg is a Mahjong 4 players computer game. Play against 3 computer players! 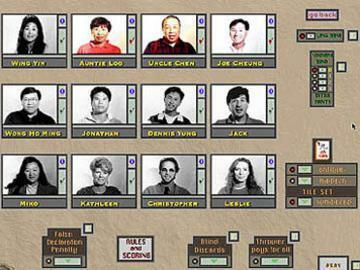 Play with authentic 4 player Hong Kong Mahjong rules & scoring. There's twelve opponents with different skill levels to play against, each with their own voices and animations. It comes with 16 background scenes of Hong Kong, or you can easily substitute your own favorite images. 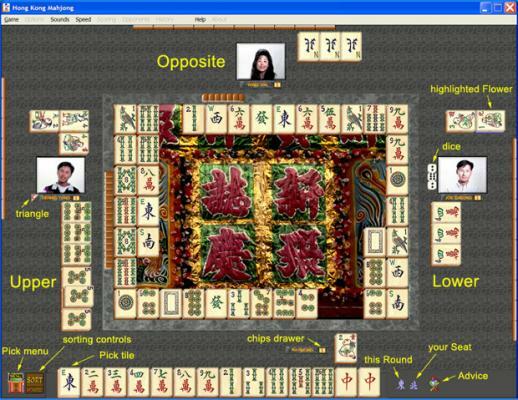 This 4 player Hong Kong Mahjong software version allows only computer opponents, but if you want to play with up to 4 friends over the Internet, then download Mahjong MJ or other. Basic Hong Kong Mahjong Rules - 3 players. 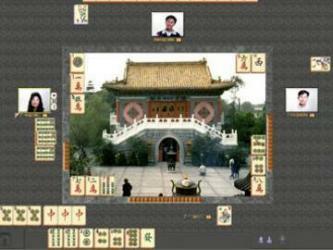 In a traditional 4 players Mahjong game, the players start the game with 13 tiles (14 for dealer) . 1. Once the game starts, each player takes turn from the dealer to draw tile and discard it in a counter clockwise order. 4. the game can be finished by any table player declaring "Hu" (mahjong or zimo) once the player's satisfies the 4 Triplet, 1 Pair pattern. 5. There are ultimately 4 Mah Jong tiles of each tile kind making up a total of 136 Mahjong tiles on the table including drawn/discarded/undrawn tiles.